Home > Family Routines > How much is too much Exercise? Exercise can be addictive. So, if you are enjoying it, there may come a point when you or others around you start to question how much is too much exercise. The answer is by no means straightforward and is different for everyone. However, there are some basic tips about how to know when it is too much for your body. Your body is the best warning system you have when it comes to telling you when you have overdone it and that means you should pay attention to it when it tells you to stop before you overexert and strain yourself. Injuries can happen for two reasons. One is if you fall or pull something in one movement. But the other type of injury is one which comes from overdoing the exercise. This is your body telling you to stop or slow down and take it easy. Some injuries caused in this way could be as simple as a sore muscle. But it can be a lot worse - if you manage to pick up a stress fracture you could be out for a while. So listen to your body telling you what is too much, and if a muscle or a joint starts to hurt, then take it easy, before you inflict real damage on yourself. One of the main reasons for many people exercising is to lose weight and get foot. But there can be such a thing as too much weight loss as well, and if you start to lose so much weight that you become underweight, then it is certainly time to stop and rest your body for a while. Remember that your body needs fuel to burn as well if you are exercising, so do not starve yourself - rather, load up on food depending on what type of exercise you are doing. 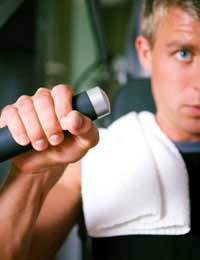 The more intensive the exercise, the more carbohydrates you will need. Again, it is a case of listening to your body and knowing when you have lost too much weight. Being underweight is as bad for you as being overweight, so do not let it happen. Exercise is a great way to relax and enjoy yourself, and can be a way of making friends and socialising. However, like everything, it is not a good idea to put all your eggs into one basket and therefore if you are doing so much exercise that you have no time for anything else, then it is probably time to stop. It is an unhealthy attitude to allow exercise to take over your life, so if you think you are spending too much time on it, take a step away and cut back to allow you to see the bigger picture. Everything is good for you in moderation, so goes the saying. It is usually wheeled out to refer to things which could be seen as vices but can be applied to virtues as well. Just as people can be intoxicated if they drink vast amounts of water, exercise be bad for you as well. Listen to people around you - coaches and friends. If they think you are doing too much but you disagree, it may be worth looking at it from their point of view. Just step back and look at the bigger picture. If you are exhausted or have no time for anything else, then it is time to cut back.